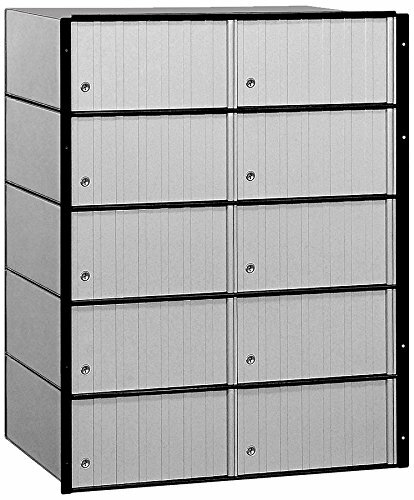 Constructed of heavy duty aluminum and stainless steel hardware, Salisbury 3300 series cluster box units (cbu's) are ideal for commercial and residential developments, multi-family homes and many other applications. These units feature a durable powder coated finish available in sandstone, bronze, Green, black, white and Gray. Salisbury 3300 series cluster box units are manufactured to U.S.P.S. "F" specifications and are an officially licensed product of the U.S. Postal service for centralized mail delivery. 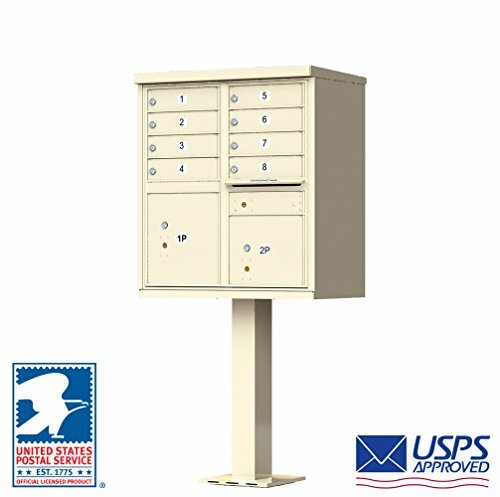 The 3300 series type III mailboxes are accessed through the front through two (2) easy opening master door panels and includes an "outgoing mail" compartment, two (2) fully integrated parcel locker and the U.S.P.S master lock access door (lock installed by the U.S.P.S). Salisbury Industries is an ISO certified company and has excelled in the field of manufacturing since 1936. Constructed of heavy duty aluminum and stainless steel hardware, Salsbury 3300 Series Cluster Box Units (CBU's) are ideal for commercial and residential developments, multi-family homes and many other applications. These units feature a durable powder coated finish available in sandstone, bronze, green, black, white and gray. Salsbury 3300 Series Cluster Box Units are manufactured to U.S.P.S. "F" specifications and are an officially licensed product of the U.S. Postal Service for centralized mail delivery. 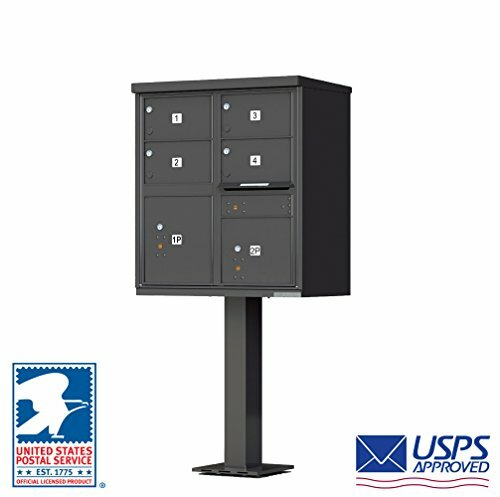 The 3300 Series Type II mailboxes are accessed through the front through two (2) easy opening master door panels and includes an "Outgoing Mail" compartment, one (1) fully integrated parcel locker and the U.S.P.S master lock access door (lock installed by the U.S.P.S). Salsbury Industries is an ISO certified company and has excelled in the field of manufacturing since 1936. 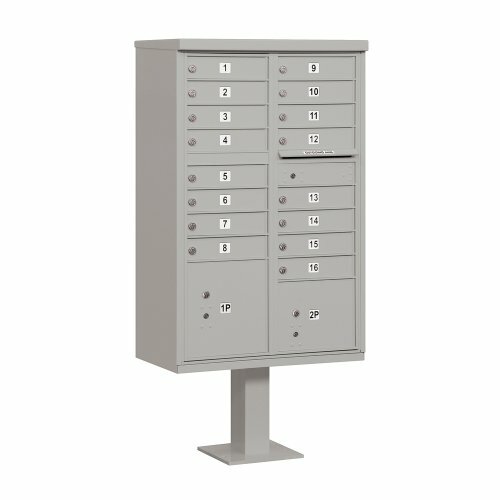 Constructed of heavy duty aluminum and stainless steel hardware, Salsbury 3300 Series Cluster Box Units (CBU's) are ideal for colleges, schools, private postal centers, corporate mail centers, military bases, government agencies and many other applications. These units feature a durable powder coated finish available in sandstone, bronze, green, black, white and gray. Salsbury 3300 Series Cluster Box Units are manufactured to U.S.P.S. "F" specifications and are an officially licensed product of the U.S. Postal Service for centralized mail delivery. 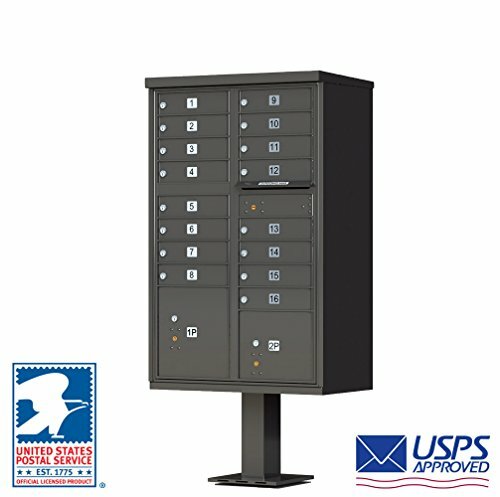 The 3300 Series Type I mailboxes are accessed through the front through two (2) easy opening master door panels and includes an "Outgoing Mail" compartment, two (2) fully integrated parcel lockers and factory installed master commercial locks with 2 keys for private access. For U.S.P.S. delivery of mail, contact your local postmaster for approval. Salsbury Industries is an ISO certified company and has excelled in the field of manufacturing since 1936. 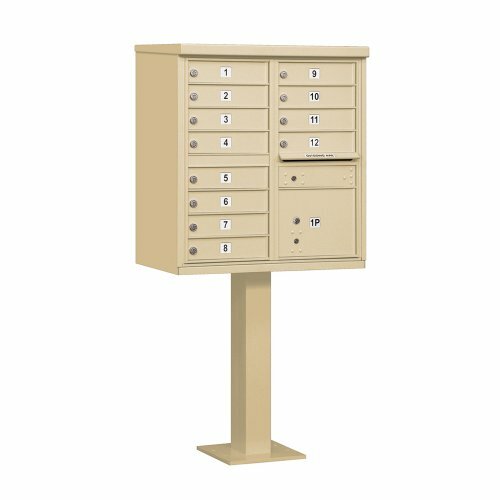 Salsbury 2200 Series Aluminum Mailboxes - Standard System - Rear Loading - Private Access are ideal for colleges, schools, private postal centers, corporate mail centers, military bases, government agencies and many other applications. Available with 4 different door sizes: (#1) 3-1/2" W x 5-1/2" H, (#2) 5-1/2" W x 5-1/2" H, (#3) 10-3/4" W x 5-1/2" H, (#4) 10-3/4" W x 11-1/2" H. Available in 6 different configurations: 30 door unit (#1 doors), 20 door unit (#2 doors), 18 door unit (16 - #2 doors and 2 - #3 doors). 14 door unit (12 - #2 doors and 2 - #4 doors), 10 door unit (#3 doors), 6 door unit (2 - #3 doors and 4 - #4 doors). Compartments are constructed of 20 gauge steel. Compartments have open backs. Doors are made of 1/4" thick extruded aluminum. Doors feature a powder coated aluminum finish. Salsbury Industries is an ISO 9001: 2008 certified company and has excelled in the field of manufacturing since 1936. 1570-8SDAF Finish: Sandstone Pebble Features: -8 mailboxes, 1 outgoing and 2 parcels. -Manufacturer provides 5 year limited warranty. -Locking box unit. Material: -Aluminum. Dimensions: -Pedestal Height: 28.5''. -Std. Compartment: 12.875''W x 3.25''H. Overall Height - Top to Bottom: -62.69". Overall Width - Side to Side: -30.25". Overall Depth - Front to Back: -17.875". 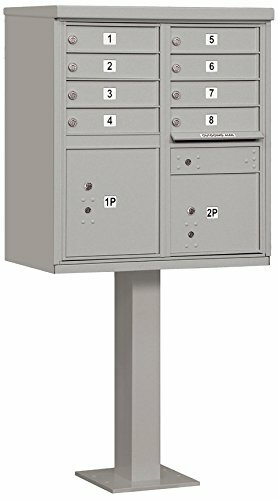 Looking for more Cluster Mailboxes similar ideas? Try to explore these searches: Footpeg Clevis, Washington Redskins Nfl Candy, and Powerpoint Music. Look at latest related video about Cluster Mailboxes. Shopwizion.com is the smartest way for online shopping: compare prices of leading online shops for best deals around the web. 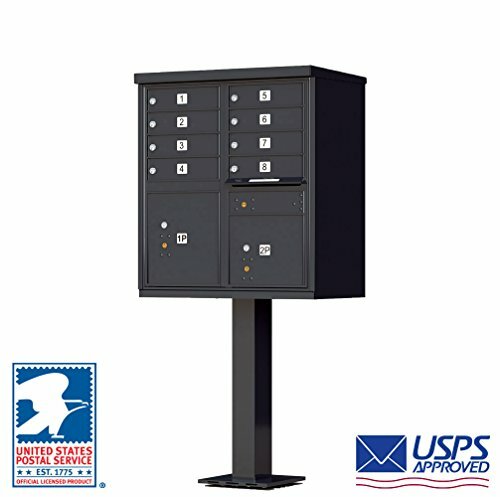 Don't miss TOP Cluster Mailboxes deals, updated daily.